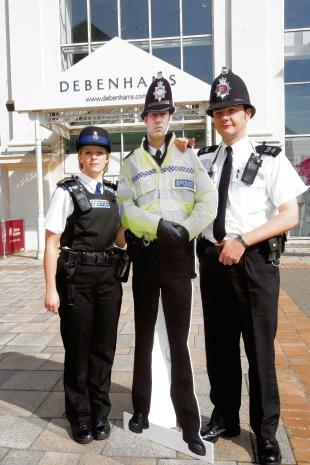 Apparently hoping to save money on law enforcement costs, the county of Essex in the UK has deployed eight life-size cardboard cutouts of police officers, which have been posted in various shops "to deter and confuse would-be criminals." Cardboard cutouts can certainly deter and confuse people, as we saw in 2007 when one of them held a New Jersey SWAT team at bay for 90 minutes while police tried to negotiate with it. But whether they work on would-be criminals remains to be seen. So far, the fake policemen in Essex do not seem to be having the desired effect, or at least I infer that from the fact that one was recently stolen. Real human police called in for backup blamed the theft on a "drunken prankster." They said 30-year-old Hadley Nye had been spotted carting away their cardboard colleague, and admitted he had stolen it from a supermarket. He was sentenced to community service and a six-week curfew, probably lucky that his victim was recovered intact. A commenter on the Daily Gazette's site said she had seen a cutout standing watch at a local store and and did not think they were likely to deter or confuse anyone with decent vision. "Only someone with very poor eyesight would mistake one of the cardboard cut outs for a real policeman," she said. "They had one on a stand chained to the entrance barrier . . . . How many policemen do you see with chains round their legs?" Maybe that's supposed to explain why the policeman never moves, but I'm probably giving somebody too much credit.